Back in April, Opera introduced a free VPN integrated into the desktop Opera browser. That feature arrived in the Opera developer channel almost a year after they acquired SurfEasy, a Toronto-based company that created easy-to-use VPN applications. 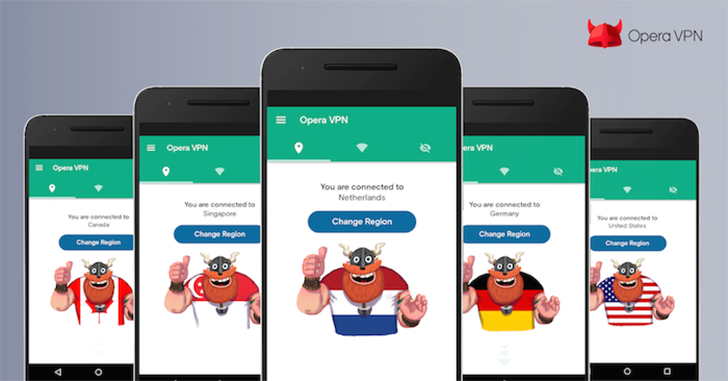 A standalone Opera VPN application was released on iOS in May, and now it's available for Android devices. Opera VPN is notable because just like the VPN in the Opera browsers, it is completely free. You can choose between a number of countries including USA, Canada, Germany, Singapore, and The Netherlands (with more countries coming soon). The application also includes a built-in ad tracking blocker, to prevent advertising networks from tracking your behavior across websites. I do want to make clear that Opera VPN is not a substitute for a paid VPN. SurfEasy claims to not save logs of VPN activity from its users, but they obviously have to pay for their servers somehow (besides the advertisements in-app). SurfEasy is also under the legal jurisdiction of Canada, where privacy and VPNs don't always go hand-in-hand. Nevertheless, Opera isn't claiming their VPN to be the most secure on the planet. For being free, it's incredibly easy to use, and it's great for accessing web content that may be blocked in your home country. The Viking mascot is pretty great, too.